It seems odd that Carnegie Hall’s 2010-11 season concluded in mid May and that the New York Philharmonic continued into the last week of June, with the final concert of its Summertime Classics coda at the end of last week. It also seems to me that the official seasons in both halls concluded in fine fettle — good news for orchestras that wholeheartedly deserve their community support in these parlous times. The first thing to point out about Carnegie’s seven-concert “Spring for Music” series is that it cost a paltry $25 a ticket for some of the most riveting programs of the year. Several of the orchestras and their music directors were a welcome discovery, being virtually unknown in these parts and proving that not all concerts break the bank. The first of the three concerts I heard, played by the Albany Symphony under its music director, David Alan Miller, included Copland’s popular Appalachian Spring but in its rarely heard complete orchestral version. When arranging the ballet’s well-known suite, Copland judiciously tightened connective passages and eliminated an entire anti-slavery pantomime section (nearly one-quarter of the ballet, timing out to 8:20 in this performance). Stylistically it harks back to his angular Stravinsky-influenced works from the 1920s and really belongs in another score, but it was good to hear for a change. Also on the program was a group of eight spirituals, each arranged for orchestra by different composers — a big success for the fine young baritone Nathan De’Shon Myers, of whom the standing and cheering audience demanded and was rewarded by an encore. Miller and his players also deserve praise for their recordings of American music for the enterprising Albany label. Jaap van Zweden and his Dallas Symphony took the biggest chance of the series with composer Steven Stucky and librettist Gene Scheer’s “concert drama,” August 4, 1964. Commissioned by the orchestra to commemorate the 100th birthday of Texas-born President Lyndon B. Johnson, Stucky and Scheer settled on the subject of two fortuitous events on that particular day: the Gulf of Tonkin incident, which resulted in the escalation of the Vietnam War, and the discovery of the bodies of three murdered civil rights workers. Serious stuff, this, and ultimately a rewarding musical experience, but obviously not what many prematurely departing audience members expected. The music isn’t overly challenging harmonically, and that pertaining to the civil rights matters is particularly moving. Still, most of it is slow and somber, with a good deal of sustained pianissimo chords underpinning quiet singing and declamation. Stucky recalls in the excellent program notes that he consciously tried to avoid writing another Britten War Requiem, which is ironically the work that keeps poking through musically. All the singers and the excellent Dallas Symphony Chorus acquitted themselves proudly, supported by orchestral players of extraordinary concentration, superbly conducted by the ensemble’s Dutch music director. My favorite concert of the series — and, as it turned out, the entire season — was by a conductor and orchestra making their New York debuts: the Oregon Symphony under its music director of eight years, Carlos Kalmar, in a remarkably imaginative program. Ives’s The Unanswered Question, John Adams’s The Wound-Dresser, and Britten’s Sinfonia da Requiem were played without pause, an often pretentious practice but one that in this instance worked stunningly. After intermission came a positively searing Vaughan Williams Fourth Symphony, with fearless edge-of-seat tempos in the third and fourth movements, breathtakingly negotiated by all, the strings in particular. Kalmar and his virtuoso Oregonians will return to “Spring for Music” in 2013. “Spring for Music” is the brainchild of classical-music biz veterans Mary Lou Falcone, David Foster, and Thomas Morris, in partnership with Carnegie Hall, and deserves a long life. Next season includes concerts by the symphony orchestras of Houston, Edmonton, New Jersey, Alabama, Milwaukee, and Nashville. June 2. Music Director Alan Gilbert led the best performance of a Bruckner symphony I’ve ever heard from the Philharmonic. While the players’ supercharged style is perfect for Mahler’s open wounds, Bruckner’s serene mysticism has been largely alien to them. But under Gilbert, the Second Symphony had that rapturous, long line and richly textured glow of all successful Bruckner performances, with the broadly paced Andante a standout. Only a few unmarked ritards detracted from an already structurally episodic work. Earlier in the evening, violinist Anne-Sophie Mutter was soloist in the world premiere of Sebastian Currier’s Time Machines, a subdued half-hour piece that was hopelessly sabotaged by coughers and sneezers. June 9. David Robertson equals stimulating programs. His Shostakovich First Symphony swaggered with brightly lit mirth, and Rachmaninoff’s Isle of the Dead was appropriately dark and moody, with an impassioned middle section. Schoenberg’s nightmarish monodrama Erwartung (1908) concerns a distraught woman combing a forest for her missing lover, whom she may have killed. At one point she stumbles over a tree stump (ah, Sigmund!). This fascinating half-hour work was on Robertson’s first Philharmonic concert, in 2001, equally masterfully on all parts. Deborah Voigt appeared a bit casual at first, but she sang well and was infinitely more subtle than Jessye Norman at the Met in 1989, who was bonkers from the outset. June 16. The young French conductor Ludovic Morlot doesn’t tarry. I missed his highly praised Philharmonic debut last season, but I won’t make that mistake again. Mussorsky’s Prelude to Khovanschchina, Ravel’s Pavane pour une Infante défunte, and Ravel’s arrangement of Mussorgsky’s Pictures at an Exhibition moved along smartly at refreshingly old-school tempos, shaving off two and four minutes, respectively, from the last time I endured the latter two works in concert. The high point, however, was Gil Shaham’s dazzling traversal of Walton’s Violin Concerto, an engagingly melodic, virtuosic showpiece written for Heifetz. It was the most recent in the violinist’s imaginative project to perform the wealth of concertos composed in the 1930s by such masters as Stravinsky, Berg, Prokofiev (his second), Bartók, Hindemith, Barber, and Britten, among others. No less accomplished was the New Yorkers’ colorful, spot-on accompaniment. Morlot succeeds Gerard Schwarz as music director of the Seattle Symphony next September, and in 2012 becomes chief conductor of Belgium’s opera house, La Monnaie/Da Munt, which I hope won’t keep him from more Philharmonic appearances. June 22. Alan Gilbert capped off his first season last year with a stunning presentation of Ligeti’s opera Le Grand Macabre and this year chose Janáček’s magical opera The Cunning Little Vixen as a grand finale. Once again, Gilbert’s Harvard buddy Doug Fitch commandeered a thoroughly winning, all-but-fully staged production, luminously sung by a huge cast and warmly played by the Philharmonic under the music director’s sympathetic leadership. Economic realities appear to have taken their toll on Gilbert’s plans next season. Despite purported sold-out houses for both of these operas in concert, next season’s final subscription concert is a standard all-Mozart affair. The spin is that Gilbert and the Phil will repair a week later to the cavernous Park Avenue Armory for two performances of a fascinating program that exploits spatial layouts for multiple orchestras: Stockhausen’s Gruppen, Boulez’s Rituel, the party scene from Mozart’s Don Giovanni, and Ives’s The Unanswered Question. Perhaps this will help to mollify those who find Gilbert’s third season less adventurous than his previous ones. I hope you read the moving memorial to Frank Milburn last week (7/8) on MusicalAmerica.com by New York Philharmonic archivist Barbara Haws. Frank was p.r. director and artistic administrator of the orchestra for over three decades. He was also an assistant editor of Musical America in the 1950s. I interviewed with him soon after arriving in New York, fresh out of college in September 1968. I didn’t get the job, but afterwards he kindly let me in to hear the Friday afternoon concert conducted by Leonard Bernstein. Are you ready? Haydn’s Symphony No. 87, Mahler’s Kindertotenlieder with Dietrich Fischer-Dieskau, and Berlioz’s Symphonie fantastique. Talk about why I left Muncie! Frank was peripherally involved later that season in one of my favorite anecdotes. I was at the long-gone Footlights cafeteria at Lincoln Center (in the job I eventually did get, p.r. gofer at The Repertory Theater of Lincoln Center), and Bernstein was finishing lunch with a group at a nearby table. They got up to join Frank who was at the door and left, and two girls walked hesitantly over to the table. They stood next to Bernstein’s chair, looked at each other and giggled, and one of them picked up the pie crust he had left, wrapped it in a napkin, and put it in her purse. Frank Milburn, New York Philharmonic music administrator, and Leonard Bernstein on the orchestra's 1968 European tour. Photo: New York Philharmonic Archives. A word about that unassuming title, “artistic administrator”: He or she coordinates all aspects of the programming and advises the music director on works to be played. Frank had that job during the tenures of Bernstein, Pierre Boulez, and Zubin Mehta. Barbara relates in her memorial that just before Frank died, Mehta called him and said that he would dedicate his evening’s performance of Mahler’s Third Symphony to him. 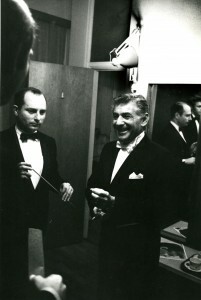 It can’t have been lost on Frank that Dimitri Mitropoulos had died while rehearsing the Third in Milan in 1960, that Bernstein conducted it at his final concert as Philharmonic music director in 1969, and that Boulez conducted it at the first concert held in Avery Fisher Hall after the 1976 renovation. 7/16 Avery Fisher Hall. Lincoln Center Festival. Cleveland Orchestra/Franz Welser-Möst. Bruckner: Symphony No. 8 (original 1887 version). 7/17 Avery Fisher Hall. Lincoln Center Festival. Cleveland Orchestra/Franz Welser-Möst. Adams: Doctor Atomic Symphony. Bruckner: Symphony No. 9. This entry was posted on Friday, July 15th, 2011 at 12:51 am	and is filed under Why I Left Muncie. You can follow any responses to this entry through the RSS 2.0 feed. Both comments and pings are currently closed.